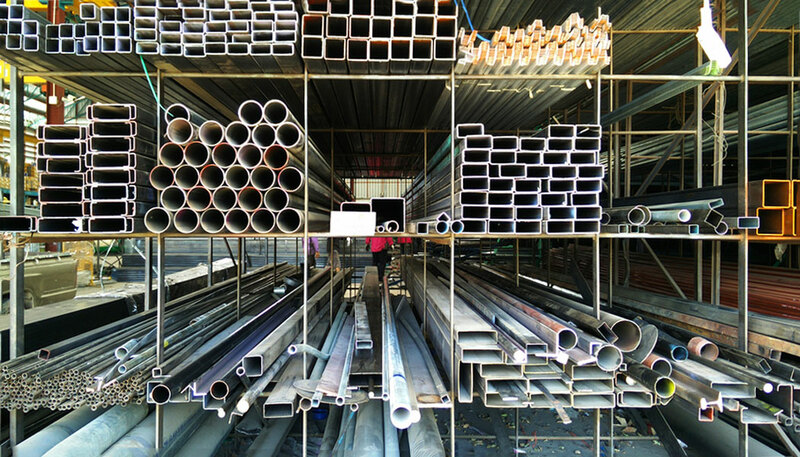 There are a number of different types of steel available, in various sizes, shapes, and finishes so as to meet the needs of the many different applications which demand steel in this country. If you have a good understanding of the unique properties and benefits that each of these steel varieties have, you may be able to achieve major cost savings, as well as ensuring optimal performance and quality of the finished product. Hot rolled steel and cold rolled steel each have their own benefits and features which make them ideal for specific industries and applications. The primary difference between these two different steel types is the manufacturing processes which are used to produce them, and these processes will be described below, as well as the results caused by those processes. Cold rolled steel is basically hot rolled steel which has been put through additional processing, e.g. being re-rolled at a normal room temperature. Strain hardening can signficantly add to the strength of the finished product and provide a very appealing smooth finish, which can sometimes be highly desirable. The cold rolled steel process creates a product which is harder and stronger than its hot rolled partner, and allows it to be used in situations which call for more exacting dimensions. Tubes for instance, are straighter and exhibit outstanding concentricity and uniformity, and steel bars are legitimately square, with their edges and squares being more precise. If there is a drawback to using cold rolled steel, it’s that it is limited to just a few shapes, and those are primarily square and round shapes. Any kind of shaping operations have the capability of creating steel products in various forms, e.g. bars, sheets, strips, and rods, which are generally smaller than hot rolled products. The applications which cold rolled steel are generally used in include those where exceptional durability and tolerance is necessary. The process which is known as hot rolled steel gets its name because the manufacturing process takes place at temperatures over 1000°F, which is significantly higher than the temperature at which most grades of steel will re-crystallize. As it cools, the steel re-configures itself, achieving a looser tolerance than it originally had. Products become easier to manage and work with due to the forming which takes place, since the malleability of hot rolled steel makes it conducive to being formed into a considerable number of different shapes. Products made from hot rolled steel are generally much larger than those made from cold rolled steel, and since reheating is unnecessary, hot rolled steel often works out to be much less expensive than cold rolled steel. The applications which are ideal for hot rolled steel include those where exact specifications are less important, because the steel shrinks as it cools, which makes it difficult to control the precise specifications of the end product. Hot rolled steel bars are often used in construction applications and in welding for I-beams, or train track cross-sections. The hot rolled steel process is also used very frequently to create sheet-metal. If there’s a downside to hot rolled steel, it’s that scaling is sometimes produced on the surfaces. Scaling is caused by the cooling process which occurs after undergoing the extreme temperatures. If scaling causes a major issue for the application, it can be effectively removed by blasting, grinding, or using an acid bath process, so the hot rolled steel can be rendered optimally usable. AAA Tool & Machine is recognized as a valued partner in the metal stamping industry for our strong Tool Design and Build competency. This, combined with our metal stamping capacity, precision machining services, and EDM capability make us a full service provider that can deliver value in your tooling and stamping needs. Contact us today to see how we can help you work even better.